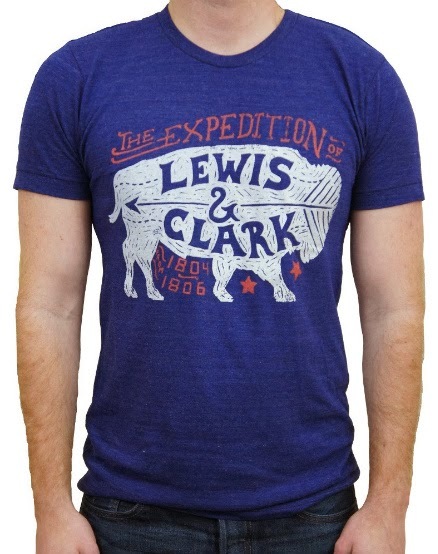 no mas pantalones: Declaration Clothing "Lewis & Clark"
Declaration Clothing "Lewis & Clark"
Declaration Clothing's most recent design "Lewis & Clark" celebrates possibly the greatest "road trip" in American history, setting up the westward expansion of the United States. The buffalo represents the wildlife roaming the grasslands during their travels, the arrow like those of the Indians the Corps of Discovery established diplomatic relations with along the way. Prepare for your next adventure in either a mens heather indigo or gray tee, or a womens heather gray scoop neck.